The North Papers span the 1910s through the 1960s, most of them from 1930 to 1960. Joseph North was a journalist who covered the Spanish Civil War for The Daily Worker and New Masses; his wife Helen joined him in Spain, working in medical service. 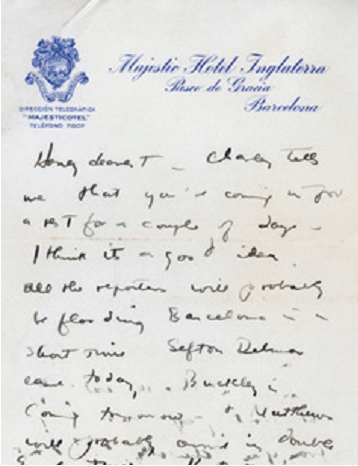 Their letters to each other form a small but historically significant portion of the collection. There is also extensive correspondence among a con-stellation of family and friends including Helen’s sister, Lydia, who was active in union organizing in Chicago in the 1930s and was married to an Abraham Lincoln Brigade volunteer; and between Joseph and his brother, the composer Alex North. Many of the documents pertain to the life and work of the wom-en’s father, Morris Oken, a textile worker who emigrated from Russia and was active in the Workmen’s Circle and other social-ist and labor organizations based in the Lower East Side at the turn of the 20th century. A gift from Joseph and Helen’s daughter Nora North, the papers are remarkable not just for the political and labor activities they document, but also for their illumination of relationships within a family in which politics and idealism were lived out, reverberating through generations. Lydia’s husband was Dave Mates.